Leo S. Lavatelli, professor emeritus of physics, will be remembered for his consuming interest in teaching the introductory calculus-based physics courses, the notorious Physics 106, 107, and 108. His enthusiasm for physics was infectious, and he thrived on the interactions with beginning students. Long before the current interest in physics curriculum reform, Leo spent a sabbatical year (1969-70) investigating how introductory physics was taught around the world—spending time with physics faculties in Hong Kong, Tokyo, Tbilisi, Moscow, Leningrad, Warsaw, Prague, Marseilles, and Tehran. In the College of Engineering’s five-year and ten-year post-graduation surveys, his name was always mentioned as a respected and influential teacher. One grateful senior wrote in 1979, the year Leo retired, that "Lavatelli taught Physics 342 with enthusiasm and with an eye to explaining the way the world around us works, not just the way equations are solved." 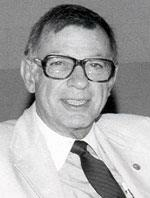 Leo Lavatelli was born August 15, 1917, at Mackinac Island, Michigan, a son of Silvio and Zella Cunningham Lavatelli. He died on Sunday, May 17, 1998, at Nash General Hospital, Rocky Mount, North Carolina. He is survived by his wife, Olwen Thomas Lavatelli of Spring Hope, North Carolina; a daughter, Shana Lavatelli of Laytonville, California; a son, Mark Leo Lavatelli of Buffalo, New York; two stepdaughters, Alice Cone of Spring Hope, North Carolina, and Caroline Williamson of Bloomington, Indiana; two stepsons, Thomas Williamson of Macon, Georgia, and Capt. Hugh S. Williamson of Stafford, Virginia; and five grandchildren. He graduated from the California Institute of Technology in 1939. He earned an M.A. in physics from Princeton University in 1943, where he was recruited for the Manhattan Project to work on Robert R. Wilson’s isotron project to separate U-235 at Los Alamos. After the war, he enrolled at Harvard University and earned an M.S. in physics in 1949. He joined the physics department at the University of Illinois in 1950, and received his Ph.D. from Harvard in 1951. He was originally assigned to work on the cyclotron at Illinois, but instead, he became involved with the new Control Systems Laboratory (now the Coordinated Science Laboratory), where he worked on novel controls for aircraft and for an electric delay line. He retired in 1979, after sending a matter-of-fact note to Head Ralph Simmons, detailing his plans to finish his work on the Physics 123 and 124 external course syllabi revisions, clear out his office, and brief his replacement on the Qualifying Exam Committee. He ended characteristically, "I do ask you and your office, respectfully, not to spread the information of my retirement in case some misguided soul in an outburst of sentimentality might be tempted to throw a retirement social function for me, which I would not attend, since I am mostly out of town, anyway." Leo was possessed of a wonderful zest for physics, and he remained interested and involved in explaining physical puzzles long after his retirement. He was a lifelong supporter of our department, which he once described as a collection of "prima donnas, hard-nosers, low-profilers, operators, pushers, leave-me-aloners, graduate students (what a conglomeration, what a mix of academics!)."